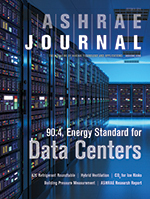 Take time to familiarize yourself with ASHRAE Standard 90.4 for Data Centers which was approved in June. How the standard for data centers was developed. The synergy between Standard 90.1 and Standard 90.4. The standard’s paths for compliance. If you are an ASHRAE member, you can read the article on the Journal page of the organization’s website, www.ashrae.org.